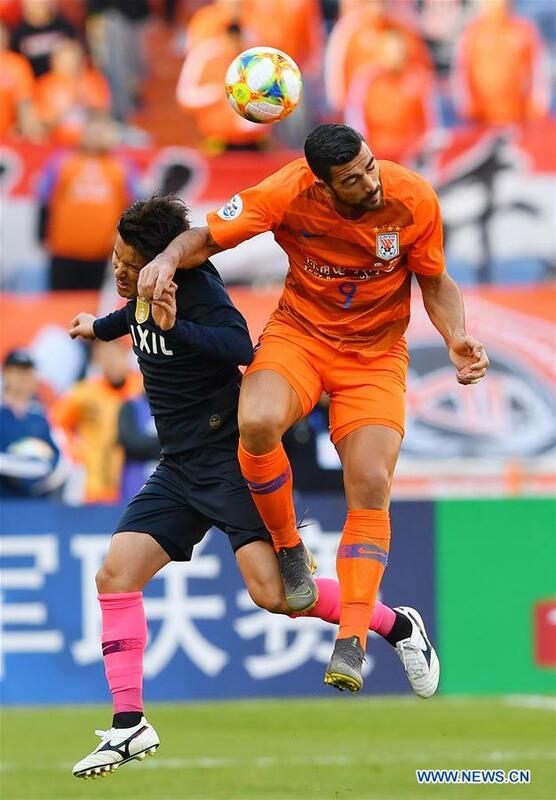 Graziano Pelle starred with a brace as Shandong Luneng came back from two goals down to salvage a 2-2 draw with AFC Champions League holders Kashima Antlers in a Group E tie on Tuesday. After an even opening period, Sho Ito silenced the home crowd at Jinan Olympic Sports Centre as he gave defending champions Kashima the lead on 10 minutes, linking with Leo Silva and then striding into the area to steer home a low shot. And Ito then doubled his and the visitors' tally less than four minutes later, with the forward beating the offside trap to reach Taki Hirato's defence-splitting reverse pass and dinking the ball over the onrushing Shandong custodian Wang Dalei. Shandong's poor start to the game was mitigated on 19 minutes, though, as Kashima midfielder Kento Misao handled inside the area and Pelle duly converted the resulting spot-kick to reduce the deficit. The Italian international completed his brace – his fourth goal of the Continental campaign – and Shandong's comeback, four minutes before the interval when he latched onto a loose ball in the area and swept it past Kwoun Sun-tae to draw the scores level. Kazuma Yamaguchi could have restored Kashima's lead on the 53rd minute but he was denied by a smart save from Wang Dalei, while at the other end of the field ex-Manchester United star Marouane Fellaini headed over for Shandong after the hour mark. But Leo Silva perhaps should have found a last minute winner for Kashima when he was found inside the six-yard area by substitute Shoma Doi but the Brazilian could only direct the ball straight at Wang Dalei. Having drawn their opener by the same scoreline last week away at Gyeongnam FC, Shandong will next host Malaysia's Johor Darul Ta'zim on April 9, while Kashima will travel to Korea Republic to face Gyeongnam FC.